I am celebrating over 28 years as a professional Interior designer helping families create their customized "inspired" homes. I specialize in interior design, custom window treatments, kitchen and bath design, home remodeling consultation and design, and home staging. My company serves southwestern Ohio. A native of Cincinnati, Amber spent her formative years in the rich architectural landscape of Washington, DC. She graduated from O’More College of Design in Franklin, Tennessee, where she gained valuable experience in understanding how people interact with and live in their homes and work spaces. Amber is passionate about creating quality designs for her clients’ homes. It is important to her that a home be as functional as it is beautiful and that her clients can truly live in the spaces she creates. Her top priority is to be an attentive listener as she guides her clients through the design process. From the paint color to the furniture, rugs to window treatments, every choice you make for your home impacts the overall look and feel. Make sure your home reflects your style and taste by seeking the help of a professional interior decorator. 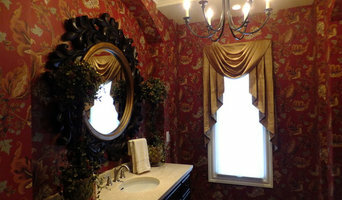 Carmen Mackey with Decorating Den Interiors has been creating beautiful rooms for years. Whether your style is traditional or modern, rustic or luxurious, Carmen Mackey with Decorating Den Interiors' have the experience to help you choose the products and design that suit your style and your budget. Anyone can furnish a house. I can design your home. My interior design service makes it fun to find one piece – or many – that reflect you and your style. We are able to offer a very unique, creative, and customized space for your nursery or child's bedroom. Our designer hand crafts one-of-a-kind items and personalized art for each project and selects decor to compliment. Incorporating your ideas and desires, we create a special space just for you and your little bundle of joy. Contact us to learn more about how we can make the beginning of this new chapter of your life a very special, customized experience for you and your family! Expert Redesign and Home Staging certification course offered in Cincinnati by Diane Agricola. Diane is an award winning ASID designer who immerses her students into her design firm. Training includes classroom and hands on experience. Visit www.agricolaredesign.com to learn more or to register. Class size is limited. Your home is the "still-life" that you live in! I have been in business for over 25 years. . I feel very strongly about working with the needs of my individual clients.For my older clients, making it possible to stay at home as long as possible is often the goal My ultimate goal is to make your home just that - yours! My creativity and exclusive design choices are inspired from nature, public places, art, fabrics, and various cultures. My interior designs are a piece of art you live in. It affect those who come into your home and business space in a positive, uplifting way! A well design space is not only beautiful but practical. From start to completion each project is uniquely designed and tailored to my clients’ needs, desires, and style to achieve results that exceeds their expectations. Located in The Greater Cincinnati Area but take interior design request throughout the US. Based in Ohio for the past ten years, I have lead the design of Custom Home Builds, Full Renovations, Kitchen and Bathroom Remodels, and Redecorated many living spaces from traditional to contemporary. I do not have a "type" or "style" that I specialize in — I adapt to your specific taste and style to make your vision the most beautiful it can be. This skill was learned throughout my fashion background, and is a unique perspective that I bring to every project. My love of textiles and color is rooted in 10 years in the fashion industry working with top designers in New York City — combined with 10 years experience decorating and renovating homes in Cincinnati, Northern Kentucky and Columbus — I bring a unique perspective to your project. I've incorporated my love of designer fashion, textiles and color expertise into a passion for the home and the relationship of all the items in it. I believe everyone should feel comfortable and happy in their home, and your home is a reflection of who you are. I bring to life those special touches that can only be Found with a keen eye and a high taste level. From an entire home build to working with existing décor — we'll work together to redesign and update your surroundings. I work one on one with my clients and my select subcontractors to make our vision become a beautiful and unique reality. I pride myself on putting the client first and having that one-on-one relationship. I believe in that unique special something that is sometimes Found along the way in ones travels. I want to bring that special one of a kind item or feeling back into our lives — away from cookie cutter mainstream design that is so prevalent today. Functional Elegant Design, Found at Home. Offering a full range of design services — from working with you to custom build your dream home, remodel your kitchen or bath, to decorating your living space — I will work with you from concept through completion and help you visualize your dream and make it a reality. If you are looking to design your dream home, give Amy a call at (201) 512-5759 or click the "Contact Me" button to send a message. We look forward to working with you! Michelle just loves design, and she has honed her skills through education and professional experience. She has a degree in interior design from Miami University and has been with Ethan Allen since 2007. As a senior designer, her goal is to build relationships with her clients and create spaces that are as unique as they are. While she is skilled at layering patterns and textures popular in French and traditional styles, she also loves the simplicity of contemporary design and everything in between. Her favorite part of her job is creating design visuals to show her clients all of the design possibilities for their spaces. We are a full service interior design firm. We do everything from flooring, wall coverings, lighting, custom window treatments, custom bedding, upholstery furniture and casegoods. 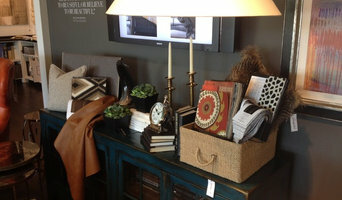 We work hand in hand with our clients to determine what your style is and what is going to function best in the space. At Decorating Den Interiors whether it be furniture, draperies, blinds, shades, cornices, valances, rugs, lamps, art, accessories, flooring, wall coverings, bedding, closet systems, we offer a full selection of home decor products in good, better, best qualities. The same holds true for pricing. You establish the budget and we know which suppliers can suit your needs. A comfortable energy is the goal of my designs. I want each of my spaces to make lasting memories for my clients; conversation around the table of their newly designed kitchen, the smell of amazing food and visiting with friends, baking cookies with the kiddos, snuggling up to watch a movie with your loved ones in your new living room, taking a break at the end of a long week in your spa bathroom retreat. I am careful to put function first, while maximizing the spaces to facilitate many functions. I strive to create spaces that allow the energy one needs in the morning but also the calm that is needed in the evening. 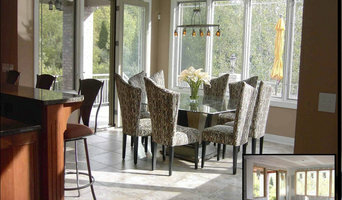 Residential interiors, specializing in custom furnishings and draperies, home management and styling.